Springbank is rightly proud that all parts of its production, from malting to bottling, are carried out at the distillery. Not many distilleries can boast that so authenticity is at least assured. The malt pours the colour of old gold, and has a characteristic piny aroma I associate with this distillery. Delve a little deeper and the aroma reveals coconut, vanillas and frangipane. Close to sublime! A rich mouth feel is delivered with quite a strong alcoholic attack which is a pity as it detracts from the sweet flavours of pine, almonds and vanilla. The flavours become more dry and bitter through to the finish with coconuts and pine still present. There is some class to this whisky in the aromas but the drinking experience is less fulfilling. A few smoother casks might have ironed out the bumps and pushed this malt into the 90’s, but I’m still a fan. I have a feeling that once the discerning whisky drinking public grow to appreciate the particular flavour profile found in the Campbeltown malts they could become as vaunted as those from other coastal regions. The birth of Glengyle (Kilkerran) and rebirth of Glen Scotia bode well for the further development of this tiny region. Yes, Nozinan is quite right, hear hear. A solid suggestion. 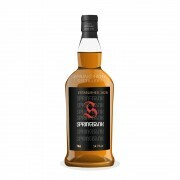 While I don't have much familiarity with the 15 year variety, I have found that a rough and bitter Springbank often smoothes out with time. Not sure why, but the phenon is magickal. I think it has improved a bit since its cork got first popped. This bottle has been open for at least a couple of years already so might have gained and lost some flavours in that time.